The following interview, conducted by two unnamed newspapermen, appeared in the Japanese-language text Aikido by Kisshomaru Ueshiba, Tokyo, Kowado, 1957, pages 198-219. It was translated from the Japanese by Stanley Pranin and Katsuaki Terasawa. A: When I was a college student my philosophy professor showed us a portrait of a famous philosopher, and now I am struck by his resemblance to you, Sensei. O Sensei: I see. Maybe I should have entered into the field of philosophy instead. The spiritual side of me is more emphasized than the physical side. B: It is said that Aikido is quite different from Karate and Judo. O Sensei: In my opinion, it can be said to be the true martial art. The reason for this is that it is a martial art based on universal truth. This universe is composed of many different parts, and yet the universe as a whole is united as a family and symbolizes the ultimate state of peace. Holding such a view of the universe, Aikido cannot be anything but a martial art of love. It cannot be a martial art of violence. For this reason Aikido can be said to be another manifestation of the Creator of the universe. In other words, Aikido is like a giant (immense in nature). Therefore, in Aikido, heaven and earth become the training grounds. The state of mind of the Aikidoist must be peaceful and totally nonviolent. That is to say, that special state of mind which brings violence into a state of harmony. And this I think is the true spirit of Japanese martial arts. We have been given this earth to transform into a heaven on earth. Warlike activity is totally out of place. A: It is quite different from the traditional martial arts, then. O Sensei: Indeed, it is quite different. If we look back over time, we see how the martial arts have been abused. During the Sengoku Period (1482-1558-Sengoku meaning "warring countries") local lords used the martial arts as a fighting tool to serve their own private interests and to satisfy their greed. This I think was totally inappropriate. Since I myself taught martial arts to be used for the purpose of killing others to soldiers during the War, I became deeply troubled after the conflict ended. This motivated me to discover the true spirit of Aikido seven years ago, at which time I came upon the idea of building a heaven on earth. The reason for this resolution was that although heaven and earth (i.e., the physical universe) have reached a state of perfection and are relatively stable in their evolution, humankind (in particular the Japanese people) seems to be in a state of upheaval. First of all, we must change this situation. The realization of this mission is the path to the evolution of universal humanity. When I came to this realization, I concluded that the true state of Aikido is love and harmony. Thus the "Bu" (martial) in Aikido is the expression of love. I was studying Aikido in order to serve my country. Thus, the spirit of Aikido can only be love and harmony. Aikido was born in accordance with the principles and workings of the universe. Therefore, it is a Budo (martial art) of absolute victory. B: Would you talk about the principles of Aikido? The general public regards Aikido as something mystical like ninjutsu, since you, Sensei, fell huge opponents with lightning speed and have lifted objects weighing several hundred pounds. O Sensei: It only seems to be mystical. In Aikido we utilize the power of the opponent completely. So the more power the opponent uses, the easier it is for you. B: Then, in that sense, there is Aiki in Judo, too, since in Judo you synchronize yourself with the rhythm of your opponent. If he pulls, you push; if he pushes, you pull. You move him according to this principle and make him lose his balance and then apply your technique. O Sensei: In Aikido, there is absolutely no attack. To attack means that the spirit has already lost. We adhere to the principle of absolute nonresistance, that is to say, we do not oppose the attacker. Thus, there is no opponent in Aikido. The victory in Aikido is masakatsu and agatsu; since you win over everything in accordance with the mission of heaven, you possess absolute strength. O Sensei: Absolutely not. It is not a question of either sensen no sen or sen no sen. If I were to try to verbalize it I would say that you control your opponent without trying to control him. That is, the state of continuous victory. There isn't any question of winning over or losing to an opponent. In this sense, there is no opponent in Aikido. Even if you have an opponent, he becomes a part of you, a partner you control only. B: How many techniques are there in Aikido? O Sensei: There are about 3,000 basic techniques, and each one of them has 16 variations . . . so there are many thousands. Depending on the situation, you create new ones. A: When did you begin the study of martial arts? O Sensei: At about the age of 14 or 15. First I learned Tenshinyo-ryu Jujitsu from Tozawa Tokusaburo Sensei, then Kito-ryu, Yagyu Ryu, Aioi-ryu, Shinkage-ryu, all of them Jujitsu forms. However, I thought there might be a true form of Budo elsewhere. I tried Hozoin-ryu Sojitsu and Kendo. But all of these arts are concerned with one-to-one combat forms and they could not satisfy me. So I visited many parts of the country seeking the Way and training. . . but all in vain. A: Is that the ascetic training of the warrior? O Sensei: Yes, the search for the true Budo. When I used to go to other schools I would never challenge the Sensei of the dojo. An individual in charge of a dojo is burdened with many things, so it is very hard for him to display his true ability. I would pay him the proper respects and learn from him. If I judged myself superior, I would again pay him my respects and return home. B: Then you did not learn Aikido from the beginning. B: When did Aikido come into being? O Sensei: As I said before, I went to many places seeking the true Budo... Then, when I was about 30 years old, I settled in Hokkaido. On one occasion, while staying at Hisada Inn in Engaru, Kitami Province, I met a certain Takeda Sokaku Sensei of the Aizu clan. He taught Daito-ryu Jujitsu. During the 30 days in which I learned from him I felt something like an inspiration. Later, I invited this teacher to my home and together with 15 or 16 of my employees became a student seeking the essence of Budo. B: Did you discover Aikido while you were learning Daito-ryu under Takeda Sokaku? O Sensei: No. It would be more accurate to say that Takeda Sensei opened my eyes to Budo. A: Then were there any special circumstances surrounding your discovery of Aikido? O Sensei: Yes. It happened this way. My father became critically ill in 1918. I requested leave from Takeda Sensei and set out for my home. On my way home, I was told that if you went to Ayabe near Kyoto and dedicated a prayer then any disease would be cured. So, I went there and met Deguchi Onisaburo. Afterwards, when I arrived home, I learned that my father was already dead. Even though I had met Deguchi only once, I decided to move to Ayabe with my family and I ended up staying until the latter part of the Taisho period (around 1925). Yes . . . at that time I was about 40 years old. One day I was drying myself off by the well. Suddenly, a cascade of blinding golden flashes came down from the sky enveloping my body. Then immediately my body became larger and larger, attaining the size of the entire universe. While overwhelmed by this experience I suddenly realized that one should not think of trying to win. The form of Budo must be love. One should live in love. This is Aikido and this is the old form of the posture in Kenjitsu. After this realization I was overjoyed and could not hold back the tears. B: Then, in Budo, it is not good to be strong. Since olden times the unification of "ken" and "Zen" has been taught. Indeed, the essence of Budo cannot be understood without emptying your mind. In that state, neither right nor wrong have meaning. O Sensei: As I said previously, the essence of Budo is the Way of masakatsu and agatsu. B: I have heard a story about how you were involved with a fight with about 150 workers. O Sensei: I was? As I remember. . . Deguchi Sensei went to Mongolia in 1924 in order to accomplish his goal of a greater Asian community in line with the national policy. I accompanied him on his request even though I was asked to enter the Army. We traveled in Mongolia and Manchuria. While in the latter country, we encountered a group of mounted bandits and heavy shooting broke out. I returned their fire with a Mauser and then proceeded to run into the midst of the bandits, attacking them fiercely, and they dispersed. I succeeded in escaping danger. A: I understand, Sensei, that you have many connections with Manchuria. Did you spend a long time there? O Sensei: Since that incident I have been to Manchuria quite often. I was an advisor on martial arts for the Shimbuden organization as well as for Kenkyoku University in Mongolia. For this reason, I have been well received there. B: Hino Ashihei wrote a story called "Oja no Za" in Shosetsu Shincho in which he discusses the youthful period of Tenryu Saburo, rebel of the Sumo world, and his encounter with the martial art of Aikido and its true spirit. Does that involve you, Sensei? B: Then, does that mean that you were associated with Tenryu for some period? O Sensei: Yes. He stayed in my house for about three months. B: Was this in Manchuria? O Sensei: Yes. I met him when we were making the rounds after a celebration marking the 10th anniversary of the establishment of the government of Manchuria. There was a handsome looking man at the party and many people prodding him on with such comments as, "This Sensei has tremendous strength. How about testing yourself against him?" I asked someone at my side who this person was. It was explained to me that he was the famous Tenryu who had withdrawn from the Sumo Wrestler's Association. I was then introduced to him. Finally, we ended up pitting our strength against each other. I sat down and said to Tenryu, "Please try to push me over. Push hard, there's no need to hold back." Since I knew the secret of Aikido, I could not be moved an inch. Even Tenryu seemed surprised at this. As a result of that experience he became a student of Aikido. He was a good man. A: Sensei, have you also been associated with the Navy? O Sensei: Yes, for quite a long time. Starting in about 1927 or 28, for a period of about 10 years I was a part-time professor at the Naval Academy. B: Did you instruct soldiers at the time you were teaching at the Naval Academy? O Sensei: I have taught quite often for the military, beginning with the Naval Academy around 1927-28. In about 1932 or 19331 started a martial arts class at Toyama School for the Army. Then in 1941-421 taught Aikido to students of the Military Police Academy. Also, on one occasion I gave an exhibition of Aikido on the invitation of General Toshie Maeda, Superintendent of the Army Academy. B: Since you were involved in teaching soldiers, there must have been a lot of rough types and many episodes. O Sensei: Yes. I was even ambushed one time. B: Was it because they considered you an overbearing teacher? O Sensei: No, it wasn't that. It was to test my strength. It was at the time when I started to teach Aikido to military police. One evening while I was walking through the training grounds, I felt something strange going on. I felt that something was up. Suddenly, from all directions, from behind bushes and depressions many soldiers appeared and surrounded me. They started to strike at me with wooden swords and wooden rifles. But since I was accustomed to that sort of thing I didn't mind at all. As they tried to strike me I spun my body this way and that way and they fell easily as I nudged. Finally, they all became exhausted. At any rate, the world is full of surprises. The other day I met one of the men who attacked me. I am an advisor to the Military Police Alumnae in Wakayama Prefecture. During a recent meeting one individual recognized my face and came up to me grinning. After we had talked for a few minutes, I learned that he was one of the men who had attacked me that day many years ago. While scratching his head he related to me the following: "I'm very sorry for that incident. That day we were talking about whether or not the new professor of Aikido was really strong. A group of us, hot-blooded military police types, were discussing the matter and decided to test the new teacher. About 30 men lay in wait. We were completely amazed that we 30 self-confident men could do nothing against your strength." C: Were there any episodes while you were at the Toyama School? O Sensei: Strength contests?...One incident took place, I believe, before the episode with the military police. Several captains who were instructors at the Toyama School invited me to test my strength against theirs. They all prided themselves in their abilities, saying things like: "I was able to lift such-and-such a weight," or "I broke a log so many inches in diameter". I explained to them, "I don't have strength like yours, but I can fell people like you with my little finger alone. I feel sorry for you if I throw you, so let's do this instead." I extended my right arm and rested the tip of my index finger on the end of a desk and invited them to lay across my arm on their stomachs. One, two, then three officers by themselves over my arm, and by that time everyone became wide-eyed. I continued until six men lay over my arm and then asked the officer standing near me for a glass of water. As I was drinking the water with my left hand everyone was quiet and exchanging glances. B: Aside from Aikido, you must have tremendous physical strength. Kisshomaru Ueshiba: Of course he possesses strength, but it should be described as the power of Ki, rather than physical strength. Some time ago, when we went to a new settlement in the country, we saw seven or eight laborers trying in vain to lift a huge tree stump. My father stood looking at it for a while and then asked them to step aside so he could try it. He lifted the stump easily and promptly carried it away. It is totally inconceivable to do such a thing with mere physical strength. Also there was an incident involving a certain Mihamahiro. B: Was he the same Mihamahiro of Takasago Beya Sumo Wrestling Association? O Sensei: Yes. He was from Kishu Province. When I was staying at Shingu in Wakayama, Mihamahiro was doing well in the Sumo ranks. He had tremendous strength and could lift three rods which weighed several hundred pounds. When I learned Mihamahiro was staying in town, I invited him to come over. While we were talking Mihamahiro said, "I've also heard that you, Sensei, possess great strength. Why don't we test our strength?" "All right. Fine. I can pin you with my index finger alone," I answered. Then I let him push me while I was seated. This fellow capable of lifting huge weights huffed and puffed but could not push me over. After that, I redirected his power away from me and he went flying by. As he fell I pinned him with my index finger, and he remained totally immobilized. It was like an adult pinning a baby. Then I suggested that he try again and let him push against my forehead. However, he couldn't move me at all. Then I extended my legs forward, and, balancing myself, I lifted my legs off the floor and had him push me. Still he could not move me. He was surprised and began to study Aikido. A: When you say you pin a person with one finger, do you push on a vital point? O Sensei: I draw a circle around him. His power is contained inside that circle. No matter how strong a man he may be, he cannot extend his power outside of that circle. He becomes powerless. Thus, if you pin your opponent while you are outside of his circle, you can hold him with your index finger or your little finger. This is possible because the opponent has already become powerless. B: Once again, it's a matter of physics. In Judo also, when you throw an opponent or pin him you place yourself in the same position. In Judo, you move in various ways and try to place your opponent in such a position. A: Is your wife also from Wakayama Prefecture? O Sensei: Yes. Her maiden name in Wakayama was Takeda. A: The Takeda family name is closely associated with the martial arts. O Sensei: You might say that. My family has been loyal to the Imperial Household for many generations. And we have been wholehearted in our support. In fact, my ancestors gave up property and fortune and moved all over in service of the Imperial Family. B: Since you too, Sensei, have been moving around continuously from the time you were a young man, it must have been very difficult for your wife. O Sensei: Since I was very busy I didn't have very much leisure time to spend at home. Kisshomaru Ueshiba: Since my father's family was rather well-to-do, he was able to pursue Budo shugyo (ascetic training in the martial arts). And another thing, another of my father's characteristics is that he has little concern for money. The following incident took place on one occasion. When my father settled in Tokyo in 1926, his second visit to the capital, he first came alone and then was followed by the family, which came up from Tanabe in 1927. The place where we all settled was at Sarumachi, Shibashirogane in Tokyo. We rented that place with the aid of Mr. Kiyoshi Yamamoto, a son of General Gambei Yamamoto. At that time, my father owned a fairly large amount of property around Tanabe, including both cultivated and uncultivated fields and mountainous terrain. However, he had little cash. He had to borrow money to get by. In spite of this, it never occurred to him to sell any land. Not only that, when his students brought over monthly offerings he would respond, "I don't want this sort of thing." He told them to offer it to the kami-sama (deity) and never accepted money directly. And when he was in need of money he would humbly present himself in front of the altar of the kami-sama and receive gifts from the deity. We never thought about charging money for Budo. The training hall at that time was the billiard room in Count Shimazu's mansion. Many dignitaries, including military officers such as Admiral Isamu Takeshita as well as many aristocrats, came to practice. The name we used was Aikijujitsu or Ueshiba-Ryu Aikijitsu. B: What is a good age for starting Aikido training? Kisshomaru Ueshiba: You can start training at around age 7 or 8, but ideally serious training should start at about 15 or 16. Physically speaking, the body frame becomes sturdier and the bones somewhat stronger at that age. Besides, Aikido contains many spiritual aspects (of course, so do other forms of Budo), so at that age one begins to acquire a perspective of the world and of the nature of Budo. So, all in all, I would say 15 or 16 is a good age for beginning the study of Aikido. B: Compared with Judo, there are very few occasions when one grapples with his opponent in Aikido. So not much physical strength is required in Aikido. Besides, you can handle not just one but many opponents at the same time. It is truly ideal as a Budo. In that regard, are there also many hoodlum-types who come to study Aikido? Kisshomaru Ueshiba: Of course, that sort of individual enrolls, too. But when this type of person studies Aikido with the intention of using it as a tool for fighting, they don't last long. Budo is not like dancing or watching a movie. Rain or shine, you must practice at all times during your daily life in order to progress. In particular, Aikido is like spiritual training practiced using a Budo form. It can never be cultivated as a tool by those who would use it for fighting. Also, individuals inclined towards violence cease to behave in that manner when they learn Aikido. B: I see . . . through constant training they stop behaving like hoodlums. O Sensei: Since Aikido is not a Bu (martial method) of violence but rather a martial art of love, you do not behave violently. You convert the violent opponent in a gentle way. They cannot behave like hoodlums any longer. B: I see. It is not controlling violence with violence, but transforming violence into love. A: What do you teach first as the fundamentals of Aikido? In Judo one learns ukemi (falling) . . .
Kisshomaru Ueshiba: First, body movements (taisabaki), then Ki flow. . .
A: What is Ki flow? Kisshomaru Ueshiba: In Aikido, we constantly train to control our partner's Ki freely through the movement of our own Ki, by drawing the partner into our own movement. Next, we practice how to turn our bodies. You move not only your body but your arms and legs together. Then the whole body becomes unified and moves smoothly. B: Watching Aikido practice, students seem to fall naturally. What kind of practice to you do for ukemi? Kisshomaru Ueshiba: Unlike Judo, where you grapple with your opponent, in Aikido you almost always maintain some distance. Consequently, a freer type of ukemi is possible. Instead of falling with a thud as in Judo, we take circular falls, a very natural form of ukemi. So we practice those four elements quite diligently. B: So you practice tai no sabaki (body movements), Ki no nagare (Ki flow), tai no tenkan ho (body turning), ukemi, and then begin the practice of techniques. What type of technique do you teach first? Kisshomaru Ueshiba: Shiho nage, a technique to throw an opponent in many different directions. This is done in the same manner as the sword technique. Of course, we use bokken (wooden swords) as well. As I said before, in Aikido even the enemy becomes a part of your movement. I can move the enemy freely at will. It follows naturally that when you practice with whatever means you have available, like a staff or a wooden sword, it becomes as much a part of you as an arm or a leg. Therefore, in Aikido what you are holding ceases to become a mere object. It becomes an extension of your own body. Next is Iriminage. In this technique you enter just as your opponent tries to strike you, and at that time two or three Atemi (strikes) are made. For example, the opponent strikes at the side of your face with his fist or hand blade (tegatana). Using your opponent's power, you open your body to the left rear as you lead the opponent's right hand with your two extended hands, continuing the direction of his movement. Then, holding your opponent's hand you move it in a circular motion around his head. He then falls with his hand wrapped around his head .... This, too, is the flow of Ki There are various sophisticated theories about this point. The opponent is left totally powerless, or rather, the opponent's power is led in the direction you want to take him. So the more power the opponent has, the easier it is for you. On the other hand, if you clash with you opponent's power you can never hope to win against a very strong person. O Sensei: Also, in Aikido you never go against the attacker's power. When he attacks you striking or cutting with a sword, there is essentially one line or one point. All you need to do is avoid this. B: Aikido contains many spiritual elements. How long would it take to acquire a basic understanding of Aikido starting from the very beginning? 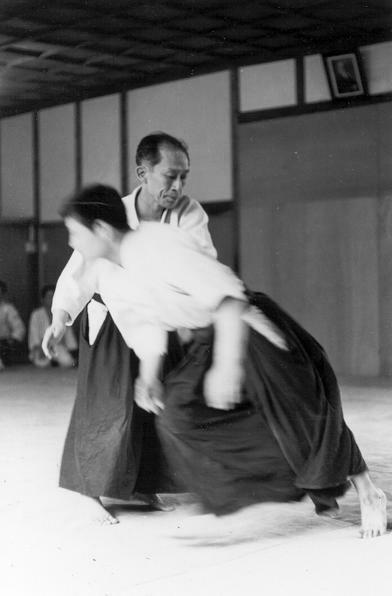 Kisshomaru Ueshiba: Since there are both coordinated and uncoordinated people I can't make any general statement, but when a person practices for about three months he comes to have some understanding of what Aikido is. And those who have completed three months of practice will train for six months. If you practice for six months, then you can continue for an indefinite time. Those who have only a superficial interest will quit before three months. B: I understand there will be a Shodan examination the 28th of this month. How many black belt holders are there currently? Kisshomaru Ueshiba: The highest rank is 8th degree, and there are four of them. There are six 7th degree black belt holders. And the 1st degree holders are quite numerous, but of course this figure only includes those having contacted Hombu Dojo after the War. B: I understand there are a considerable number of people learning Aikido in foreign countries as well. 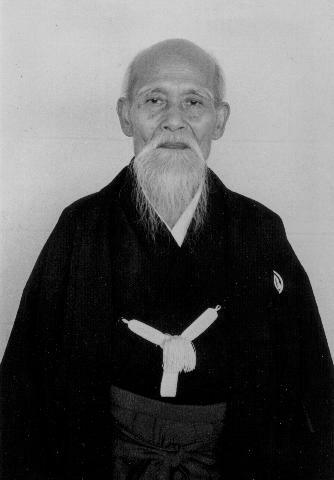 Kisshomaru Ueshiba: Mr. Tohei has visited Hawaii and the U.S. for the purpose of teaching Aikido. The most popular place for Aikido is Hawaii, where there are 1200 or 1300 practitioners. This figure for Hawaii would be equivalent to 70,000 or 80,000 Aikidoists in Tokyo. There are quite a few black belt holders in France as well. There is one Frenchman who began studying Aikido after injuring himself practicing Judo. He wanted to experience the spirit of Aikido but was not able to accomplish this in France. He felt that to seek the true spirit of Aikido he had to go to the birthplace of the art. He explained that this is why he came to Japan. The Panamanian ambassador is also studying Aikido, but it seems that the climate in Japan is too cold for him and he doesn't practice in the winter. Also, there is a lady named Onada Haru who went to Rome to study sculpting. She has been coming to the dojo since the time she was a student at the Tokyo School of Fine Arts. I just recently received a letter from her where she says she happened to meet an Italian who practices Aikido, and he treated her very well. A: And concerning the interpretation of Aikido techniques? O Sensei: The essential points become masakatsu, agatsu, and katsuhayai. As I said previously , masakatsu means "correct victory" and agatsu means "to win in accordance with the heavenly mission given to you." Katsuhayai means "the state of mind of rapid victory". A: The Path is long, isn't it? O Sensei: The Aiki Path is infinite. I am 76 years old now, but I am still continuing my search. It is not an easy task to master the Path in Budo or the arts. In Aikido you must understand every phenomenon in the universe. For example, the rotation of the Earth and the most intricate and far-reaching system of the universe. It is a lifelong training. B: So, Aiki is the teachings of Kami (God), as well as the martial way. Then what is the spirit of Aikido? O Sensei: Aikido is Ai (love). You make this great love of the universe your heart, and then you must make your own mission the protection and love of all things. To accomplish this mission must be the true Budo. True Budo means to win over yourself and eliminate the fighting heart of the enemy... No, it is a way to absolute self-perfection in which the very enemy is eliminated. The technique of Aiki is ascetic training and a way through which you reach a state of unification of body and spirit by the realization of the principle of heaven. B: Then Aiki is the way to world peace? O Sensei: The ultimate goal of Aiki is creation of heaven on earth. In any case, the entire world must be in harmony. Then we do not have a need for atomic and hydrogen bombs. It can be a comfortable and pleasant world. The Aiki Kai is the original and official body of Aikido in the world under the authorisation of the World Aikido Headquarters, Japan (www.aikido.org.au). All gradings are officially recognised worldwide. We are a not for profit association.